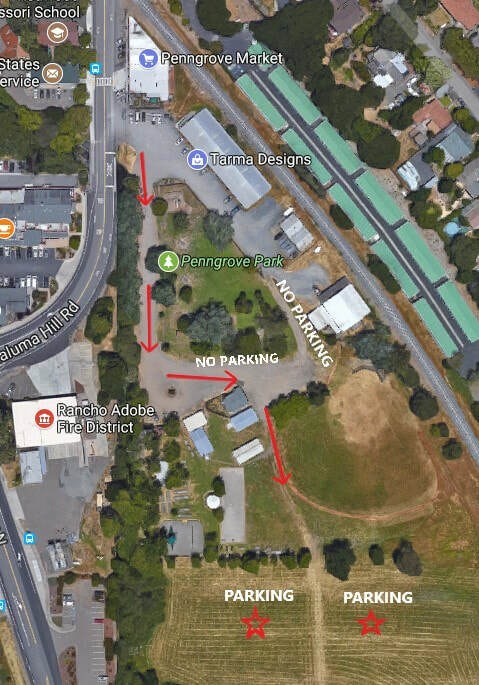 Parking at the Penngrove Park. You may download and print a map here. The park consists of over 4 acres, and is owned, maintained and managed by the Social Firemen. Park hours are from 8:00 a.m. until Dusk and the playgrounds, swings, horse-shoe pits, individual barbeques and picnic tables are used by small groups, children and families at no charge. For large groups there is a rental fee, and reservations are required. Major facilities include the ball park, Bar-B-Que pits with tables to seat 200 people, as well as sinks, a wet bar, bathrooms, and a gazebo/bandstand. Lighting can be provided for some areas of the park for evening functions. A caretaker lives on the premises. The park is the staging area for the annual Penngrove Celebration Parade, held the first Sunday, in July, and the popular Bar-B-Que after the parade. The park facilities can be rented for large parties such as reunions, company picnics, birthday parties, weddings and other uses where more space is required. To make reservations, or for more information about renting the park, call Bev Palm 707-782-1183.